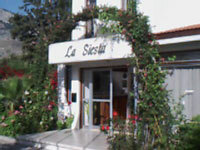 La Siesta - Is a family run holiday village situated in a peaceful location less than five minutes walk from the sea, The resort consists of twenty spacious villas positioned amongst beautiful well established gardens, with luxury fresh water swimming pool and terrace bar. For those of us that are more energenic, we also have a small gymnasium within the resort. Relaxation - La Siesta offers the benefits of both sea and mountain air along with the peacfulness of this north cypriot village, making it a perfect resort for health and relaxation. Supermarket - The super markets are local and inexpensive, We do keep stock on site of most basic food requirements. ie. bread, milk and butter etc. Our on site restaurant offers a menu of both fine wines. Breakfast, Lunch or dinner areand available individually for half board or full board residents at excellent prices. Diving - Amphora diving is PADI and BSAC approved, they can offer a wide range of courses to suit your level of expertise. 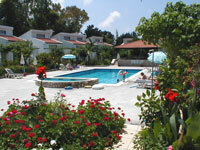 There is no rainfall, as a rule in North Cyprus between June and September. The best time to visit for temperate weather is from March to May and from about mid-September to mid-October. At the earlier time, fine weather is complemented by carpets of spring flowers and greenery. July and August together comprise the hottest, and most busiest vacation period.